Each casino will have a particular set of terminologies that they will use per game. However, there are casino terminologies that are used across the whole casino. You will learn some of them here and understand what they mean and when to use them. The Banker is the dealer when playing card games. Sometimes, players can be the banker. The bankroll is the amount of money he has for playing in the casino. The Bet is the wager that you place on any game. Betting Limit is the ceiling or base amount for the wager on each game. The Black book is a list of people not allowed to enter the casinos in Vegas. A bonus is a monetary benefit given for particular conditions like when referring a friend, signing up or being a player for a long time. The burn card is the card that is taken from the top and is removed. Card counting is used in blackjack wherein players memorize the cards that were played and increase the odds to their advantage. The casino advantage is the house edge. Chemin de Fer is a similar game as Baccarat. Chips are those used in place of cash. The cold streak is a session of successive losses. Color up is changing the smaller value chips to bigger value. The cut card is a blank card for cutting the deck. D'Alembert System allows you to increase the bet up a unit when you win and decrease the unit when losing. Deposits are online transactions to place money in an online account using a number of methods. The drop Box is a where the chips are placed. E-COGRA is an independent company that checks online casinos and ensure that they offer fair play. The edge is a form of advantage of either a player or the house. Eye in the sky is the camera used for surveillance on the casino tables. The Flash Casino is a program that uses Flash and allows a player to play directly to the browser. Gambler's Fallacy is a set of fallacious ideas about events that are isolated could affect each other. Hot Streak is when you are winning a lot. 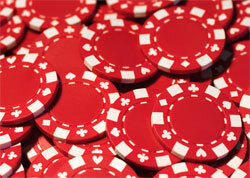 Jackpot is a massive prize money that has accumulated through time. The long run is the period when the fluctuations of wins and losses evened out. The martingale system is the system where you double your bets every time you lose one.